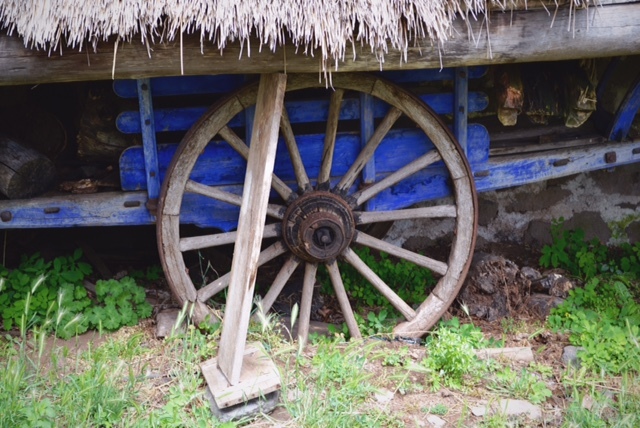 On a drizzly August day in the Haute-Loire region of France, we drove through the Auvergne hills and reached La Ferme des Frères Perrel. One thing I love about visiting this type of place is that it is off the beaten track and French is usually the only language that you will hear. This farm was occupied by the four brothers Perrel until the departure of the last brother in 1974, Foyer Saint Jean, who spent his last days in a retirement home in Laussonne. Before taking the tour of the farm, a picnic French style (bien sûr) was necessary. This means using real china and glasses. You can see in the photo that our French nephew is wearing his newly acquired and much treasured San Francisco Giants cap that we gave him. He thought it was très chouette (very cool)! There is a little shop that carries products that are local to the Auvergne region. Did you know that lentils are something very local to this area? They are known as “Lentilles Vertes du Puy” and are often served with salt meat and sausages and some bay leaves for seasoning. Miam miam ! We love shopping for local products. It was a fun surprise to see a traveler with his donkey – I couldn’t resist taking a few pictures! The area is surrounded by ancient volcanic hills, and you will see volcanic rock built into the 17th century buildings. 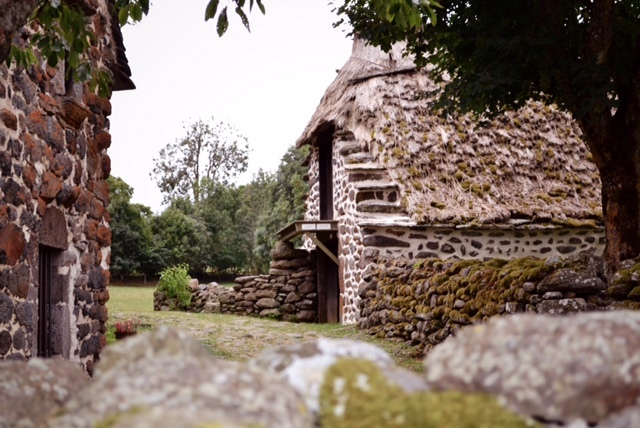 The buildings are thatched and they are so charming and beautiful, but when you go inside, you realize how small and dark the living quarters really were. They were built with the interest of warmth in the cold winter months! 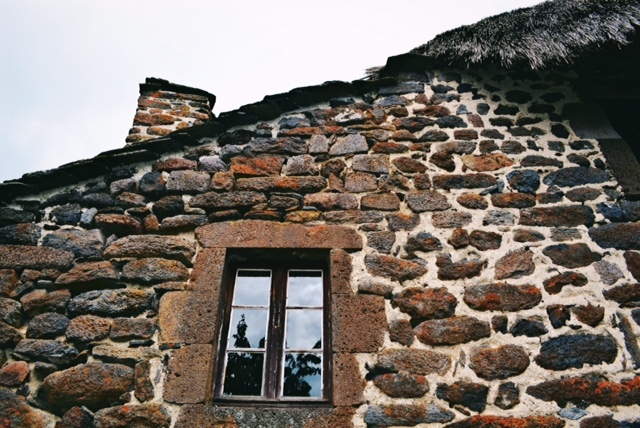 House of volcanic stone and thatched roof. The first building was built in 1640 and housed only a few cows and a family of peasants in one room on the ground floor. Upstairs, a stone vault made it possible to store the hay, away from the fireplace. Later, this room was transformed into a room, with a enclosed bed made to measure. This bed was actually built in between two rooms, with doors that opened up to either of the rooms. Enclosed bed with doors on either side. 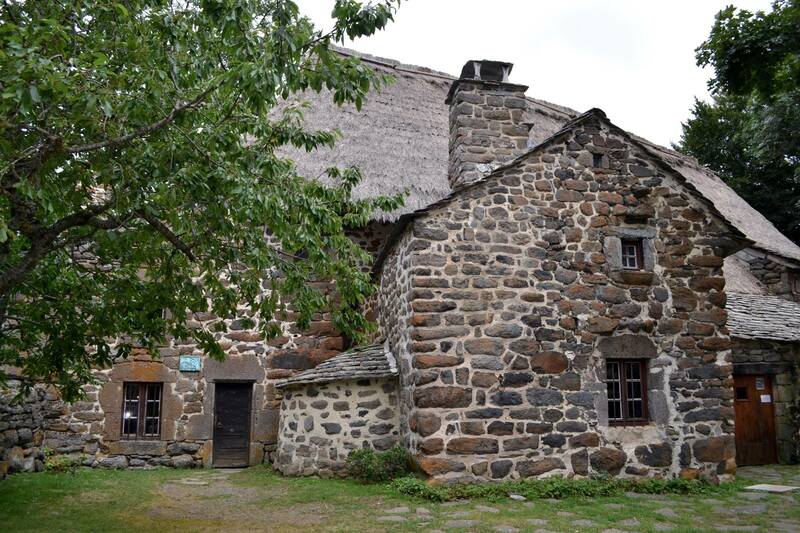 In the middle of the 18th century, the farm was enlarged. The peasants add to the ground floor a large stable, a kitchen, a bedroom and upstairs a large barn covered with rye straw. The inhabitants of this farm were able to install glass windows. People of lesser means would have used waxed paper to cover their windows. One tiny window means a dark interior! The rooms are small and dark, as large windows would make the rooms too cold in the wintertime. The room looks lighter than it actually was, because of the flash on my camera. The kitchen in the Perrel home. The inside of the barn’s roof has braids of rye straw that interlock onto the framework of the roof. The grange, or barn, with the woven rye interior roof.